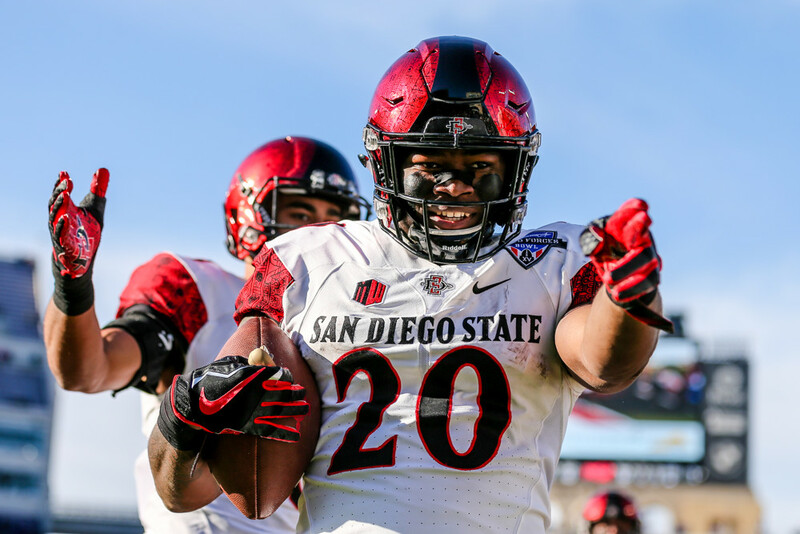 Even though former San Diego State football running back Rashaad Penny has hung up his Aztec jersey for an NFL one, he still managed to win another collegiate award. Penny was named Wednesday as the 2017-18 Mountain West Male Athlete of the Year, making him the second Aztec and the first SDSU male athlete to win the award. Track and Field star Shanieka Thomas won the Female Athlete of the Year award in 2013. The award was established by the Mountain West Joint Council in May 2010 to recognize one male and female student-athlete who achieved athletic excellent during the past academic year. The athletes also have to maintain good academic standings throughout their competition season as well as demonstrating good character and conduct on and off the field. Last season, Penny led the Football Bowl Subdivision in rushing yards (2,248), rushing yards per game (172.9), all-purpose yards (2,974) and all-purpose yards per game (228.8). He was also second in rushing touchdowns (23), total touchdowns (28), points (168), points per game (12.9) and rushing yards per carry (7.78, min. 175 att.). Last season, Penny helped the Aztecs finish with a 10-3 record, SDSU’s record third consecutive season with at least 10 wins. The school is one of seven schools in the FBS with at least 10 wins in three consecutive seasons. The others are Alabama, Clemson, Ohio State, Oklahoma, Oklahoma State and Wisconsin. Penny was selected in the first round (27th overall) of the 2018 NFL Draft in April by the Seattle Seahawks. He was the first Aztec to be chosen in the first round in 10 years since Kyle Turley was drafted in the round in 1998 and the program’s ninth first-round pick.